Big Water Flows on the Lower Sac range from 2500cfs to 15000cfs throughout the season. If we're swinging flies we can always find water to fish. 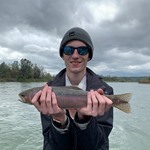 Wild Rainbow Trout We catch a lot of small and medium sized rainbows with our spey rods on the Lower Sac and occasionally a larger fish in the 18"+ range. In the fall and winter we hook some adult steelhead, too. Jet Boat Trips We typically use jet boats when we're doing spey trips on the Lower Sac. The jet boat allows us to fish the absolute best water types for swinging flies with our spey rods. Summer wet-wading The dog days of summer are a great time to swing flies on the Lower Sac. Wet wading is ideal during hot summer afternoons. Gearing up Our jet boats offer tons of room for rigging up. They're the perfect taxi-cab for getting you from one prime spot to another. Lightweight Rods We primarily fish 4 and 5wt spey rods on the Lower Sac. These rods can cast out 70+ feet but still make a 16" rainbow feel big. 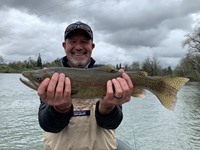 Some folks have a misconception that the only way to catch trout on the Lower Sacramento River is with a bobber. While most of the guides here fish nymphs and indicators almost exclusively (and for good reason - it puts a lot of fish in the net! ), there are other ways to catch fish on the Lower Sac. One of our favorite ways to do it is with a lightweight spey rod. The spey rod forces us to get out of the boat and wade. You get to feel the grab and enjoy the scenery as you work through a run. We can also keep our eyes peeled for dry fly opportunities while we're swinging. These trips are a lot of fun. 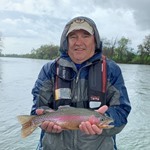 If you enjoy swinging flies for trout, book Andrew Harris, Randy Hamann or Brian Kohlman for a jet boat trip on the Lower Sac. Rods & Lines: We prefer 2, 3, and 4wt spey rods for the Lower Sac. Heavier rods are okay, but they may be over-matched for the size of the fish. Lightweight switch rods are good too. Bring a line that matches your rod. Scandi lines paired with versi-leaders work very well on the Lower Sac. Leaders & Tippet: We typically fish 2X-4X tippet for trout on the Lower Sac. Regular 9ft trout leaders tapered to 2X work really well. Waders & Boots: Chest-high breathable waders are the best choice for the Lower Sac. In the middle of summer it's nice to wet wade in the afternoon. Wading pants can also work when it's hot out. Spiked boots aren't necessary on the Lower Sac.